High quality aluminum alloy with refined polishing, high ability in steadiness & durability. High-Tech Diamond-Cut edges look elegant and fashionable. Weighted Base and Grip Pads Prevents your iWatch, Airpods and iPhone dock from knocking over when you are removing your Lightning devices or when tapping Snooze in Nightstand Mode. ONE Dock is a Durable and Practical solution. Apple watch stand - Smooth cut-out securely holds the original magnetic charger in place, concealed channel keep the redundant cable neat. Aluminum stand with silicone dock avoids scratching the watch. iPhone Stand - Showcases your device for sturdy, hands-free interaction like Face Time or Skype, conveniently turns it into a charging dock for your desktop or nightstand. Support your iPhone with different thickness case. Vertical holder for iPhone 7 / 7 Plus (2016), iPhone SE(2016), iPhone 6s/ iPhone 6s plus (2015), iPhone 6/ iPhone 6 plus (2014), iPhone5/5s. Airpods Charging Dock - Precious cutout is specially designed for Airpods Bluetooth headphone, can keep your desk neat, avoid the earphone missing. We will also send you two lightning cables with this charging stand, so you don't need frequently assemble and disassemble this product. 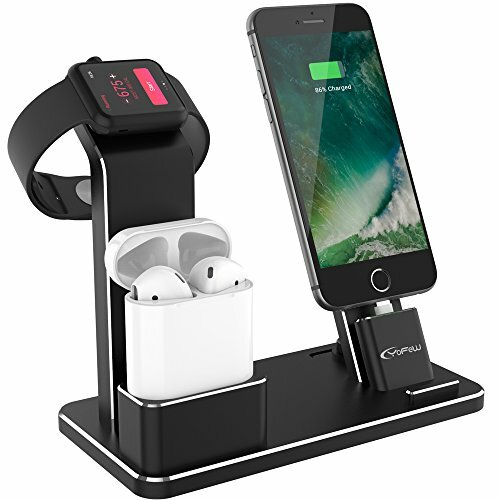 COMPATIBILITY: This apple wacth charger dock is universal for Apple Watch Series 3/ 2/ 1/ Nike+ / Sport / Edition (both for 38mm and 42mm); Apple Airpods, iPhone 8/ 8 Plus, iPhone X, iPhone7 / 7 Plus, iPhone 6 / 6s Plus, iPhone SE/ 5s/ 5c, iPad Air, iPad Mini ect. Please feel free to contact us for any question, our professional customer service team is standing by. If you have any questions about this product by YoFeW, contact us by completing and submitting the form below. If you are looking for a specif part number, please include it with your message.